Flu season is not set in stone, in fact the timing can be very unpredictable. According to the Centers for Disease Control and Prevention (CDC), flu can vary in different parts of the U.S and can be detected year-round. However, flu activity is most common in the fall and winter months from October to February. It often peaks in the colder months from December to February. One of the reasons the flu is difficult to predict and understand is that it is not a reportable disease, and in many cases, patients don’t seek out medical care. The CDC surveils the flu as best it can through mathematical models it builds based on the data reported, but it is not an exact science. Predicting an epidemic or pandemic is dependent on data and understanding the strains that may be present from year to year. Deaths from flu in children are reported to the CDC, but in adults it is not reported. It depends on surveillance of death certificates through the National Center for Health Statistics (NCHS) Mortality Reporting System for flu or pneumonia as underlying causes of death. Once again, the number of deaths from flu each year is built on mathematical models based on the data available. What the CDC has learned after years of studying data and mathematical models is that the very young, the elderly and those affected by chronic illnesses are most vulnerable to the flu and are advised to take every precaution to avoid the flu including annual flu vaccine. Nurses are key members of the prevention team in avoiding a flu epidemic. It’s essential for nurses to keep up to date on medical research and findings through continuing education for nurses so they are better prepared to educate patients and advise them with evidence-based information. Infection controlis a highly recommended CE course for nurses to stay current and educate patients in how to avoid and manage exposure to elements of infection in order to reduce exposure and avoid illness. Vaccination against the flu virus helps spread the illness and manage the epidemic status. Flu vaccine campaigns begin prior to the onset of flu season in September and continue throughout the flu season into the winter months. Vaccines are produced by private drug manufacturers. 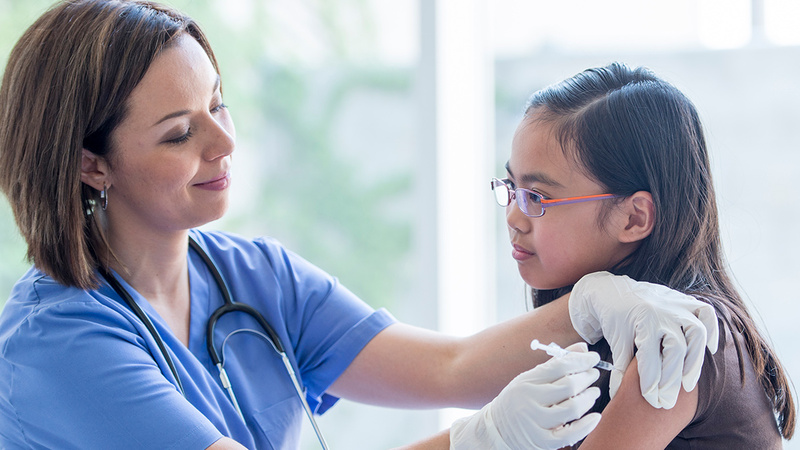 For 2018-19 flu season, manufacturers have predicted enough vaccine is available to vaccinate 163-168 million Americans. Should the need increase, manufacturers are prepared to increase production to meet the need. Vaccination is recommended for everyone 6 mos. of age and older. Children 6 mos. to 8 years will require two doses of vaccine spaced 4 weeks apart. Vaccines are available in several forms such as injection or nasal spray. There is also a stronger vaccine for those over age 65. The 2018-19 trivalent vaccine is designed to protect against currently circulating 3 strains of the virus: H1N1, H3N2, and Victoria lineage. Early vaccination is encouraged as it takes about 2 weeks for the antibodies to build up in the system and offer the best protection. Medical professionals are encouraged to be vaccinated early to avoid illness. The virus is egg-based and can cause an issue for those who have egg allergies. However, more is now known about these allergy issues and those who may develop hives with exposure to eggs are no longer considered to be at risk from the vaccine. For those who develop more serious allergic responses such a lightheadedness, recurrent emesis, respiratory distress or angioedema can still receive the flu vaccine, but they should receive licensed vaccine from a health provider who is able to recognize and manage symptoms should they arise. This means receiving the vaccine from their primary care practitioner, or in a clinic or hospital setting. The vaccine alone cannot be 100% fool proof. In addition, it is essential to take other protective actions. These are considered everyday standard precautions such as handwashing, coughing or sneezing into the elbow or a tissue, avoiding crowds, and staying home if you are sick! These are actions nurses need to instruct patients in and not make assumptions they know what to do. Handwashing for instance, is not a quick rinse and dry action. Instruct patients in how as well as when to wash their hands effectively to kill germs. Emphasize the need to stay home and avoid contact with family members who are not ill.
Other preventative actions include frequently disinfecting surfaces in the home or at work i.e. door knobs, counters, desks, handrails, communal areas. Drink plenty of fluids, get sufficient sleep, eat nutritious foods, stay active, manage stress. Make sure to keep hands away from the eyes, nose and mouth unless absolutely necessary. Touching a contaminated surface and then touching eyes or mouth can spread germs quickly. Avoiding exposing others to the flu needs to take precedence. People also need to understand whether they are in high risk categories and to seek medical care at the first symptoms. Those in low risk categories can manage with fluids and rest, but also need to know to seek medical care if their symptoms worsen. It may require some creative choices such as asking friends or family to grocery shop for you or utilizing home delivery services for groceries and pharmaceuticals such as cough medications to avoid crowds. If it is necessary to go out, it is advised to wear a mask, make brief and efficient outings, and wipe down shopping carts before and after use. Preplanning is advised such as having plenty of juice, water, soups, cough medications, and even masks on hand during cold and flu season. If despite best efforts flu symptoms develop, it is important to act quickly and seek medical care. The flu can be diagnosed with a nasal swab and antiviral medications prescribed to treat the flu and help prevent complications such as pneumonia. These medications work best when started within 48 hours of the first symptom especially for anyone at high risk for complications. They are not effective against other illnesses such as a common cold. Antibiotics are not effective against viruses but may be needed to treat bacterial complications such as pneumonia. Nurses can help patients understand this point and avoid demands for unnecessary antibiotic use.